Description of "Ancient Greek Philosophy"
Origin of Philosophy can be traced back to Ancient Egyptian and Indian Civilizations. Even before Greek Philosophy evolved, Indian Philosophy had taken shape and flourished widely. Ancient India, once a commercial hub, had trade connections with many other countries. Ideas and thoughts were also traded and had influenced much in Greek philosophy. Philosophers taught rhetoric, astronomy, cosmology, geometry to their disciples. Their teachings were based on arguments or teachings about any subject in Universe. They have contributed much to the society and their quotes are thought provoking. 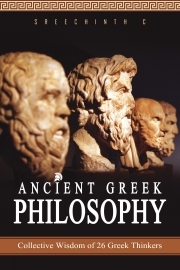 This book makes a modest attempt to present you with the quotes of Greek Philosophers -Socrates, Thales, Plato, Aristotle, Pythagoras, Anaxagoras, Epicurus, Democritus, Heraclitus, Parmenides, Chrysippus, Antisthenes, Gorgias, Empedocles, Anaximander, Cleanthes, Diogenes, Zeno of Citium, Protagoras, Epictetus, Xenophanes, Zeno of Elea, Theophrastus, Xenocrates, Melissus of Samos and Proclus. Reviews of "Ancient Greek Philosophy"